This year lawns have taken a real beating. Between the wet, cool spring, to the hot, dry summer, fungus ran rampant. 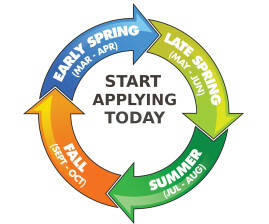 Your lawn care program might not have gone as planned since you may have missed applications altogether or your application timing was thrown off. Fall is here and remember; fall is the best time of the year to upgrade or re-seed your lawn, actually early fall is the absolute best time. Warm summer days create warm soil which is very receptive to new grass seed growth. Cooler fall temperatures and the return of normal rainfall also provide an excellent environment to grow newly sown grass. If your lawn has suffered some summer damage from heat, drought, fungus or insects, plan on re-seeding as early as possible this fall. Let’s review some tips to remember for successful fall seeding. Proper preparation is most important. Cut your lawn short, rake out all debris and try to loosen soil so grass roots can grow deep into the ground. If this is too much work consider renting a power machine to help from your local rental center. Using quality Black Beauty grass seed is also very important. Why use poor quality grass seed full of problems? Look for high germination rates and low content of crop and weed seeds and inert matter. Buy a mixture designed for use in the area you are seeding. Using Green-Up for Seeding and Sodding fertilizer will help get young seedlings off to a great start. If the area you are seeding has had problems growing grass in the past, test your soils pH levels prior to seeding. Add Mag-I-Cal to increase soil pH levels if testing shows results 6.0 or below. Apply Mag-I-Cal Plus if soil pH testing shows results greater than 7.0. These applications can all be done on the same day in no particular order after soil preparation is completed. Water the seeded area the first few weeks as needed 1 to 2 times a day for a week and then 2 to 3 times a week there after. Mow once new grass height reaches 4 inches. 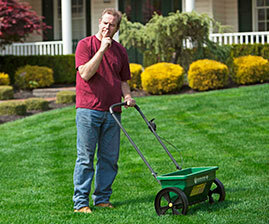 Perhaps you want to simplify your lawn program. Consider using all organic lawn products. Organic Lawn Food provides a gentle, slow feeding over time as the applications build up the soil quality. Set your mowing height to 3 inches, and try to reduce watering all together. While we cannot predict Mother Nature’s weather patterns to determine how tough each summer will be, a good healthy lawn with deep roots can withstand a lot of stresses. 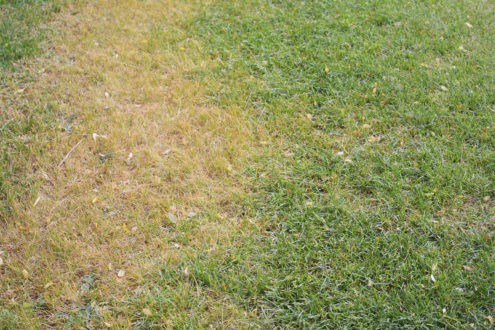 Some stress from heat and drought, insects and fungus can hopefully be tolerated by a healthy growing lawn. 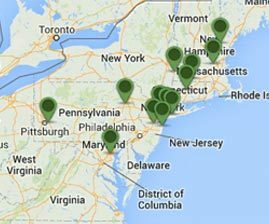 Maybe you can reduce the amount of times our lawn goes brown or dormant in the summer months with a long-term organics strategy? 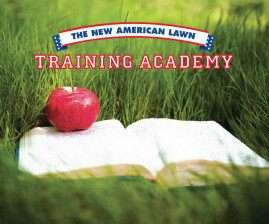 Millions of homeowners derive great joy from a great looking lawn. Pleasure derived from playing on it with the kids or dog or just looking at it provides some peace and calm. I hope you feel better about your lawn this fall and try to enjoy it. Watch some football games this weekend.